Organizing Your Holiday Decorations | Enuff with the Stuff – Sort Stow and Let It Go! Sometimes I work with clients organizing their basements and inevitably we find the stash of holiday decorations. Some people go all in and have enough decorations to deck out a Macy’s store but due to the volume, we find decorations scattered all over the space. Unfortunately, some are found in a state of disrepair or completely ruined for lack of proper storage! Don’t let that happen to your special holiday decorations. 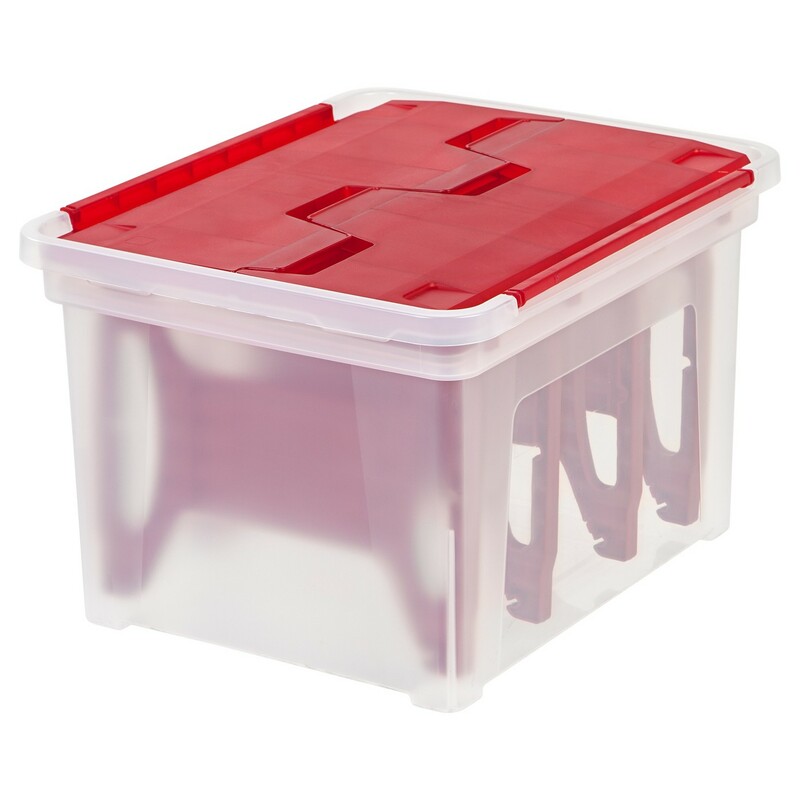 Since there are quite a few holidays upon us at this time of year, make it a goal to find the proper storage containers for all of your family décor for any upcoming holiday celebrated in your home. This year when you pulled out your boxes to display the decorations, did you discover any damaged items? Did you decide to not put some decorations out this year? Are some of the decorations looking tired and not as presentable as they once were? Once you have determined what you are using for the current holiday take a look at the rest of the items that you did not bother to use. Think about why those items weren’t used and make the decision to let them go. If they were broken or worn and not really as presentable as you would like, then toss them. Why bother storing them every year, hauling them out of storage only to wrap them back up and put them into storage unused, again?? Make room for the ones you love and display. If you have an assortment of decorations you simply are tired of using then donate them to a local charity ASAP because, after the holiday, they most likely will not be taking the decorations. Another great avenue for give away, or to even sell decorations, is to post them on FB Marketplace. When organizing anything, remember my 3P’s of organizing: Pair like items together; Purge what you no longer love or use and Place the items in the best storage based on the frequency of use. Once it’s time for taking down the decorations for the holidays, pair like items together and place them into the appropriate storage containers. Then place containers in whatever space you have designated for storage. Below are some interesting finds for various winter holidays. This comes in a three pack for $37.99 on Amazon. Heavy Duty Tear resistant 2 Pack on Amazon for $15.99! For storing your precious ornaments check out this terrific container. This brand comes in multiple sizes and the inserts can be configured for different sized ornaments. 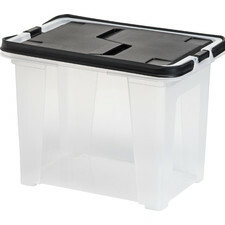 I love clear plastic storage bins which can be found just about anywhere. These are from Lowes for only $7.98. During the holidays, they always have seasonal colored bins in stock so those make a great choice for color coding the various holidays. The nice thing about plastic bins is they can be stacked right on the floor so you can do without expensive shelving. I think strands of Christmas lights are the most challenging items to pack up for the season. Try these unique storage products for lights. I have versions of both the flat plastic holder and the round wheel-like holder. Both work equally well so it may depend on the volume you are storing on each rack or wheel to determine which solution is best for you. $14.19 at Target for one box or $47.99 for a three pack at Michaels but with your coupon you can save. If your tree’s box is falling apart and there isn’t enough duct tape in the world to keep it from exploding plastic pine needles everywhere, then you need a tree bag! This one from Michael’s for $19.80. 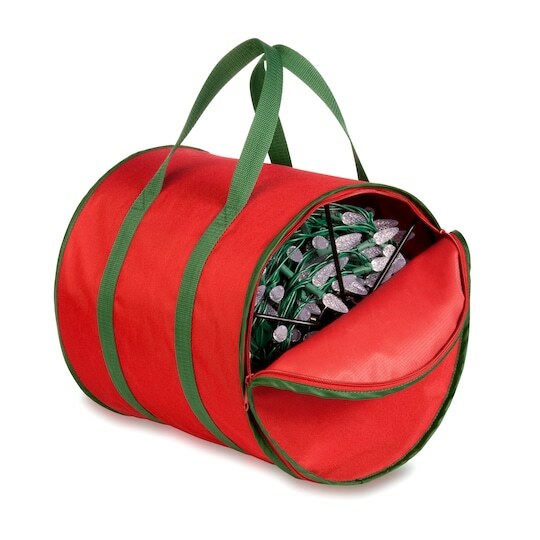 This heavy-duty bag is only $19.80 at Michaels. Grab a coupon for more savings. 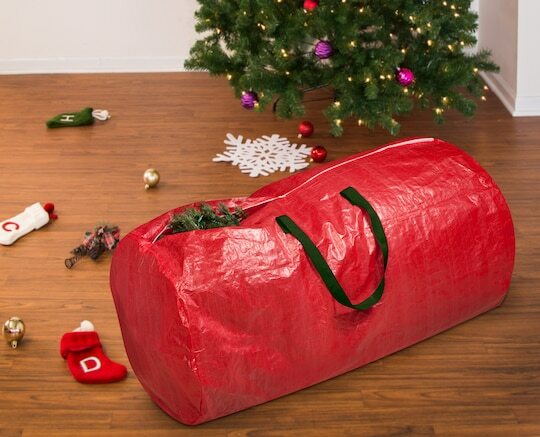 If stylish and good quality is what you are after for storing your tree, then take a look at this beauty on Amazon for $66.99. Even though Hanukkah is now over, think of giving these lovely options to family in the future. The menorahs are works of art and include storage for the candles. This unique menorah is only $49.86 on Amazon. This menorah in the shape of the Star of David is amazing. Its clever storage for the candles adds to the decorative look of the menorah. This is also on Amazon for $60.02. So whatever holiday your family is celebrating, be sure to use the right storage solutions so you aren’t opening boxes next year with damaged decorations, and starting the season off with disappointment.